Live in the heart of downtown within one minute of two subway stations. You can walk to the Eaton Centre in minutes to enjoy the largest, best mall in Toronto. There is an endless array of restaurant, bar and cafe options for you to enjoy. From this central location you can walk anywhere in the downtown core, which makes this the ideal location for an extended stay, whether you are in Toronto for a work project, or staying for a personal long term stay. 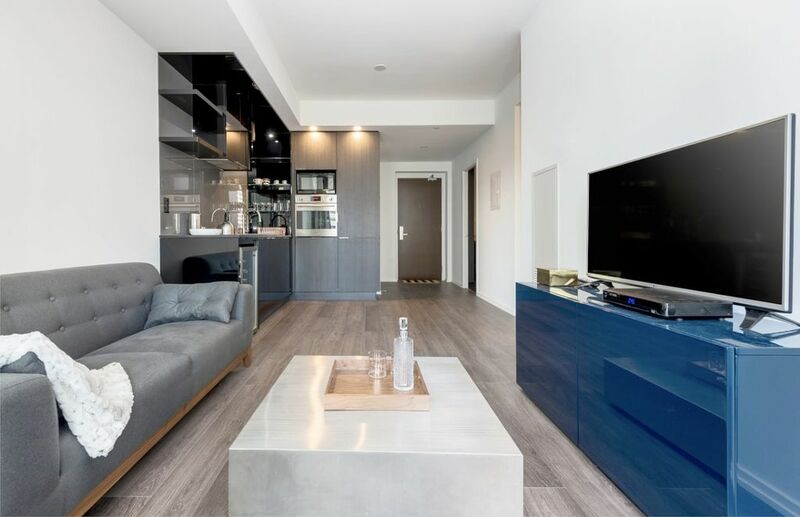 Located at the edge of the financial district, the Adelaide Executive Suite is a distinctly modern furnished short term rental Toronto suite, an urban oasis in downtown Toronto. Located near the newly launched Nordstrom and Saks Fifth Avenue department stores and the Eaton Centre, the Adelaide Executive Suite offers an unlimited amount of attractions and nearby locations to enjoy. The furnished rental apartment is an open concept 690 Sq Ft 1 Bedroom + Den condo with a large bathroom and spacious laundry/closet storage room, perfect for an extended stay in Toronto. Enjoy all the local downtown shops including Nordstrom, Saks Fifth Avenue, The Room, and Uniqlo.